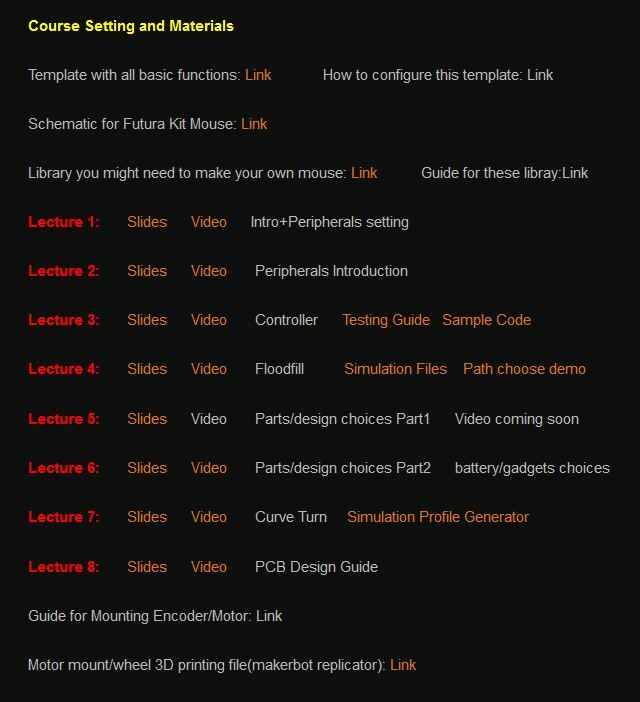 I started a project named “Futura” which is from the word “future”, by providing a cheap and high performance kit micromouse to relatively experience student at UCLA IEEE as the teaching tool to teach them knowledge necessary to drive a micromouse at professional level. Here is the demo video about how this mouse can performance, it is capable for diagonal run however I didn’t have the time to test the parameters for all turns. Lectures were given between my friends Jeremy Haugen, David Wang and I. 1-2 lectures were scheduled each week, along with the milestones/assignments for them in order to make them implement/test the code for each part. A design review were held by Jeremy, David and I at early week 7 of Winter quarter 2014 to let them start to build their own mouse after they’ve got sufficient knowledge with micromouse. They need to create a eagle schematic for their mouse and then giving specific reasoning for the choices of each parts in order to past the design review. Once they are passed the design review, lecture for PCB design guide was given to provide further help for how to make a proper PCB designing by apply some professional techniques. Now all lectures are finished, and all they need to do is to finish the PCB design and send out their design to fabrication manufactures in China with expedited shipping at the end of the week 10 of 2014 Winter quarter. The reason I decided to make such a kit mouse is because I found a way relatively easy to mount a high resolution encoder on a PCB body micromouse by using the motors from pololu. 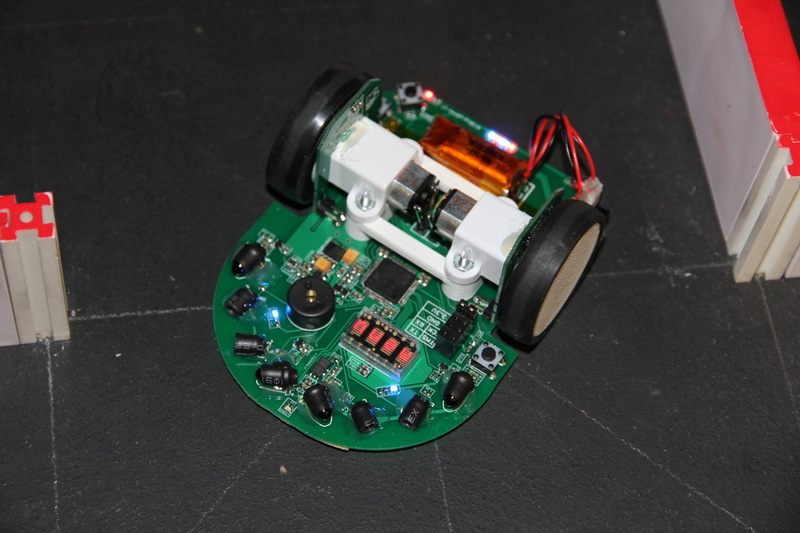 This is mouse is also design to be very easy to assemble for it’s motor and encoder part. Encoder is extremely important in order to make the mouse do curve turn and maintain robust control during the runs. 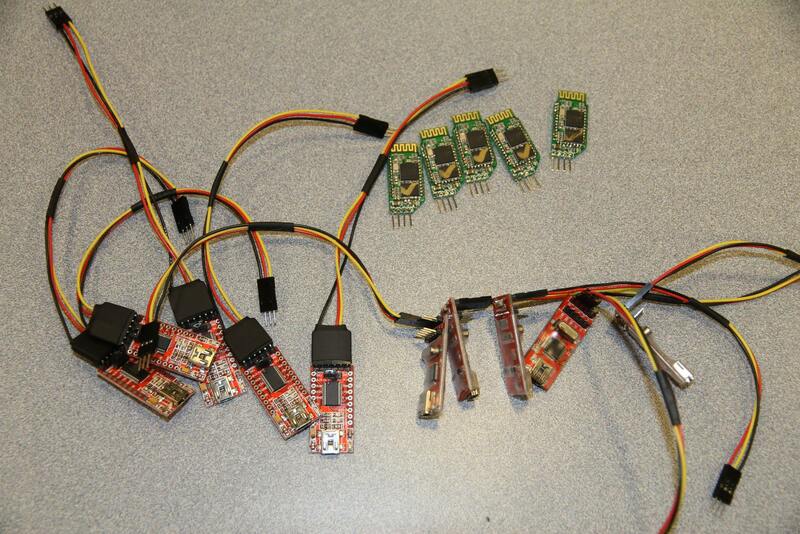 All necessary testing tools are provided, inlcuding Programmer, serial to USB adapter, bluetooth adapter, customized lipo charge and high discharge rate lipo batteries. I hope people next year will be able to utilize the same kit to pass on my knowledge of micromouse at UCLA and all other schools. Now I need a break and prepare for my Finals. This entry was posted in Micromouse Construction by Green. Bookmark the permalink. hosting provider at a fair price? Kudos, I appreciate it! Your project is awesome! But I do not know what components to use? Can you post the main components used in the Futura project? Didn’t I include all parts already? Can you tell me which motor brand you use? the motor for futura mouse is from pololu, the product number is 999 on pololu’s website. What is the microcontroller’s exact part number? Also, the gyro seems to be obsolete, is there any pin compatible replacement available? Could you please share the eagle libraries of your new mice?